This NASA chart shows the location of the New Horizons spacecraft as of Sept. 23, 2016. (NASA, JHU/APL). As countries around the world prepare to celebrate the United Nations’ sponsored World Space Week from October 4-10, the Mint reflects on its long connection to the space program. In 1971, the reverse of the circulating Eisenhower dollar coins featured an eagle on the moon. In 1992, commemorative coins in the Christopher Columbus series displayed a space shuttle on the reverse. Twelve Sacagawea dollar coins rode with the space shuttle Columbia in 1999. The 2002 Ohio quarter in the 50 State Quarters Program featured the inscription “birthplace of aviation pioneers” and featured an astronaut. 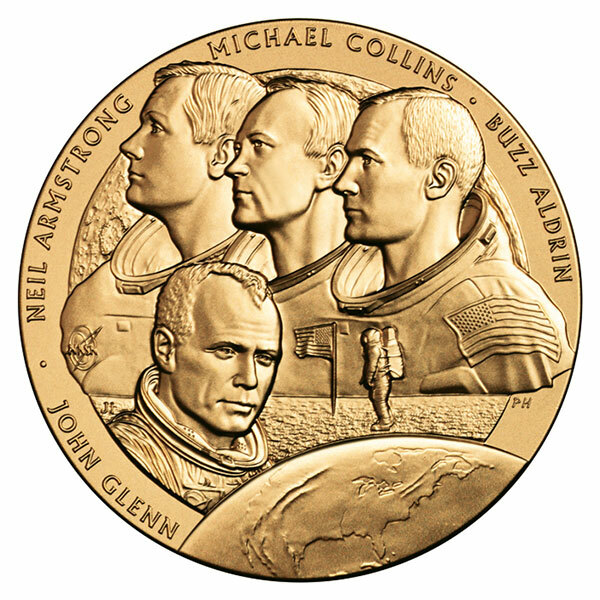 The 2011 New Frontier Congressional Gold Medal honored the 40th anniversary of the Apollo 11 space flight. A rare 1909 U.S. penny flew to Mars with the Curiosity rover in 2012. In addition to these coins and medals, two quarters from the 50 State Quarters Program have been traveling aboard the New Horizons spacecraft since 2006 and are currently 520 million kilometers past Pluto in the Kuiper Belt. The Maryland and Florida quarters were chosen to honor the states that designed and launched the spacecraft, and they have acted as spin balance weights during the trip. Illustrator Ralph Butler created the Florida design in a single sitting and entered it into the U.S. Mint’s competition at the encouragement of his mother. He added the tagline “Gateway to Discovery” out of respect for Florida’s long history of exploration. 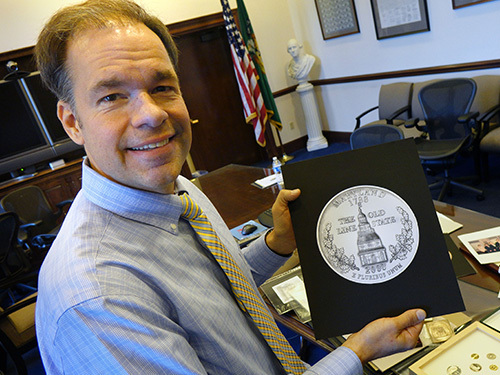 William Krawczewicz, who designed the Maryland quarter for the U.S. Mint, said he is honored to know his imagery is traveling the far reaches of space. The U.S. Mint produced over 1.2 billion Maryland quarters and over 480 million Florida quarters between its Denver and Philadelphia facilities. Maryland was the seventh quarter to be made, signifying its entrance as the seventh state in the Union, while Florida was 27th in production. Release dates were 2000 and 2004, respectively. Lou Vannicola, a distribution management specialist at the U.S. Mint in Philadelphia, remembers the atmosphere when the Maryland quarter was produced. Vannicola said he was amazed to learn that two state quarters had reached the edge of our solar system. While the voyage of the state quarters to the distant Kuiper Belt represents the latest story in the love affair between coins and space, there may be a new chapter to be written. Currently, the U.S. Congress is considering proposals in both the House and Senate for the Apollo 11 50th Anniversary Commemorative Coin Act, which would honor the 50th anniversary of the moon landing in 2019.